Our 8 hours over 8 weeks Drawing course is suitable to beginners through slightly more experienced to experienced Artists looking for a differentiated approach. Regular demos from the Instructor as well as a generous dose of individual guidance ensure you get the attention you deserve. Particularly recommended as excellent prerequisite for Disciplines such as Graphics, Animation, Fashion, Games, Architecture, Engineering or Industrial Design. Our method is user-friendly with speedy results. Students will be guided through an immersive exploration of drawing techniques and design process that are useful for developing new structures, products or illustrations. We’ll use drawing as a tool for thinking while learning to transform contour lines into three-dimensional forms represented through accurate perspective. Practical steps will guide the development of techniques to observe, analyze and invent new three-dimensional realities, while providing you with both sketchbook process drawings and a finished composition to include in your portfolio. 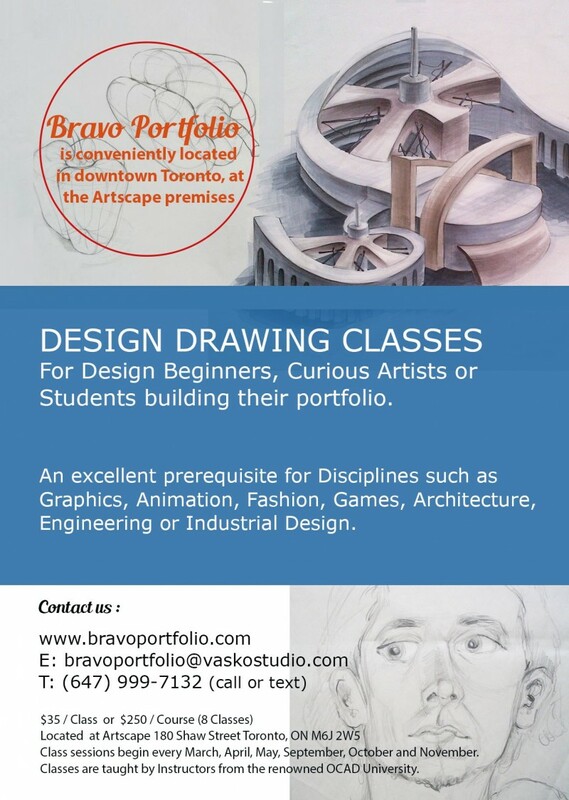 Perfect your skills or strengthen an academic entry portfolio with the help of Vassil Popvassilev, professional Artist, Industrial, Graphic Designer and Design Educator. Vassil’s impressive career includes 12 years as Instructor, at the renowned OCAD University in Toronto (see Vassil’s bio www.vaskostudio.com).